After all the hard work of trick-or-treating, it can be a little deflating to go through your plastic pumpkin or pillowcase and find filler candy instead of the good stuff—namely chocolate, like the perfect candy mashup that is the Reese’s Peanut Butter Cup. Wouldn’t it be great if there was a magic machine that changed your sordid stash into superior candy? As Delish reports, apparently there is such a thing. 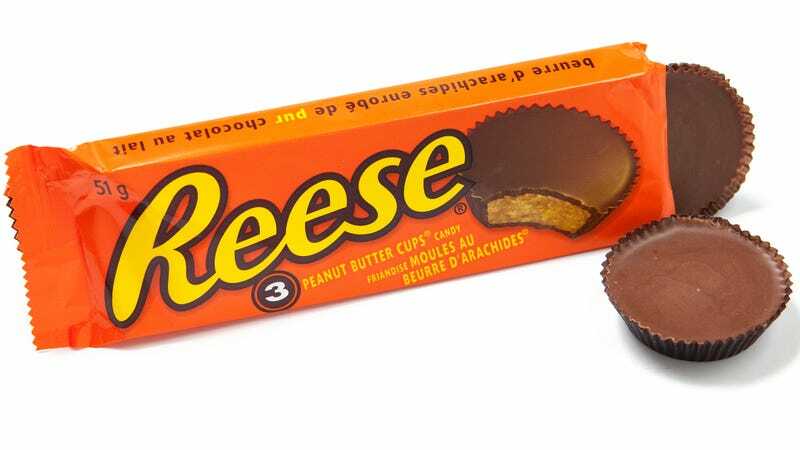 Delish says that Reese’s has created a vending machine (officially, a Candy Converter) that will collect lesser candy and swap it for Reese’s products. The machine is stocked with 10,000 Reese’s cups, to be exact. The machine officially debuted this past weekend at the Tarrytown Annual Halloween Parade, and Delish reports it’s en route to NYC for Halloween, where it will be stationed on 5th Avenue between Washington Square North and East 8th Street between 4 and 9 p.m., making some stops along the way between Tarrytown and Manhattan. Get there early, lucky New Yorkers; we suspect those 10,000 cups will go pretty quickly. Everyone else, try to remember the lame Smarties or Dum-Dum houses to avoid next year in favor of the chocolate- or Skittles-givers.